Give yourself or someone you love the gift of blessed sleep. There is no greater comfort than sleep. This 8-week online course is will teach you how to use meditation to sleep better and fully awaken, so that your rest is more fulfilling and you have more energy during your days. you'd simply like to have better, deeper, more restful sleep. 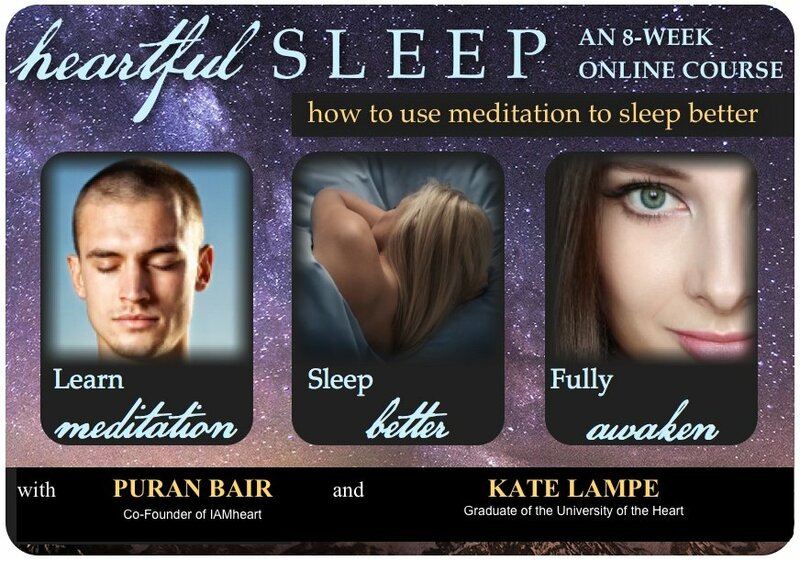 Heartful Sleep is taught by Puran Bair, co-founder of IAM Heart, and Kate Lampe, graduate of IAM University of the Heart. They will present the best methods gleaned from years of study and practice, from ancient Nidra Yoga to modern Heart Rhythm Meditation, using the insights gained from the science of sleep as well as the mystical experience of unity. Each week there are new readings and assignments to be practiced. The participants write about their experiences and questions, and are answered by Kate. Each Saturday morning there is a one-hour video conference led by Puran. No experience in meditation is required. This course will take you through 8 weeks of profound study on the nature of rhythm, dreaming, awakening, and the conscious and unconscious mind. Each week your messages will receive a personal response full of inspirational comments and suggestions. Learn the importance of solar time instead of clock time and the three hour period most important for sleep. The effect of electromagnetic fields and the easy way to neutralize them. The one essential principle for establishing a regular sleep pattern. Basic Heart Rhythm Meditation practices to calm your nervous system and mental state. The four different sleeping postures and their effect on your energetic state; when to use each one. Control the hemisphere balance in your brain and heart through a simple breathing practice. Meditate with the torus of energy that flows through you, even as you sleep. Learn the dangers of hypertonia. A simple method of measuring the residual tension in your large muscles. Use the most effective and simple practice for reducing residual muscle tension. Dissolve the performance anxiety that keeps you from ending your work day on time. Learn a simple mantra that prepares you psychologically and emotionally for sleep. I have grown spiritually. The course materials were excellent and I can not say enough about the meditations and practices that we learned during that time. I am now sleeping peacefully and actually looking forward to the night and connecting with my higher self and my heart. I now look at the night as a time of learning rather than dreading not being able to sleep. Opening to the night has opened my eyes to a whole part of life I had been missing. Thank you very much.